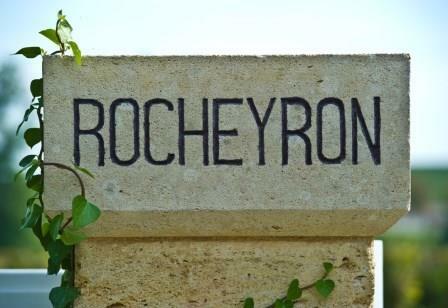 Chateau Rocheyron, following the tradition of numerous estates in the Right Bank takes its name from the location, where the vines are planted. The vineyard is situated not far from Valandraud, Chateau Faugeres and Chateau Fleur Cardinale, it is also right next to the larger vineyard of Chateau Laroque. The modern era for Chateau Rocheyron starts in 2010 when Peter Sisseck, the Danish wine maker who is best known for producing the famous wine Pingus from Spain’s Ribera del Duero, and his longtime friend, Silvio Denz purchased the estate from Stephen Adams and Denise Adams, the owners of Chateau Fonplegade, which is also located in Saint Emilion. Prior to 2010, the wines from Chateau Rocheyron lacked distinction. All that changed once Peter Sisseck and Silvio Denz became involved with the project. Chateau Rocheyron is one of the few, high-quality Bordeaux estates that does not sell their wine as futures through negociants on the Place de Bordeaux. Instead, they sell their wine directly to distributors, wholesalers and importers. The 8.45 hectare vineyard of Chateau Rocheyron is planted to 70% Merlot and 30% Cabernet Franc. The terroir is clay over limestone soils. The vineyard has old vines. On average, the vines are 45 years of age. However, some of their vines are among the oldest vines in the commune as they approach 80 years of age! All farming techniques are conducted 100% organically. The switch to organic farming took place starting with the difficult 2011 vintage. The vineyard is planted to a vine density typical of the appellation at 6,000 vines per hectare. One of the goals at the estate is to use phenolically ripe fruit, when possible and low yields, which have been averaging only 22 hectoliters per hectare! Quality is the name of the game here. In fact, due to the difficulties experienced with the 2013 Bordeaux vintage, Chateau Rocheyron declassified their entire crop, making no wine in that vintage. Following the difficulties in the 2013 vintage, Chateau Rocheyron moved to 100% organic and biodynamic farming. By 2020 they were certified for both biodynamic and organic farming. The vinification of the wine at Chateau Rocheyron takes place in a combination of traditional, cement vats and stainless steel tanks. All the work is done in a new, wine making facility, as the entire estate went through a complete, renovation shortly after it was purchased. In fact, the winery at the property was almost non existent, so they were forced to construct a new, albeit small cellar, once the property was purchased. The 2010, their debut vintage was vinified at Chateau Faugeres. The renovation was completed in 2011. The new cellar includes 7 cement vats that range in size from 32 hectoliters up to 42 hectoliters. They also added 3 stainless steel tanks that are smaller in size at just 12 hectoliters each. The variances in size allow for more parcel by parcel vinification. Malolactic fermentation takes place in a combination of cement vats and oak barrels. The wine of Chateau Rocheyron is aged in an average of 35% new, French oak barrels for up to 22 months before bottling. There is a second wine, La Fleur de Rocheyron. The annual production of Chateau Rocheyron is small at close to 750 cases per vintage. The remainder of the production is placed in their second wine. Chateau Rocheyron is better with at least 4-6 years of bottle age. Of course that can vary slightly, depending on the vintage. Chateau Rocheyron is best enjoyed in the first 5-22 years of life. Young vintages can be decanted for about 1 hour to 90 minutes. This allows the wine to soften and open its perfume. Older vintages might need very little decanting, just enough to remove the sediment. Chateau Rocheyron is best served at 15.5 degrees Celsius, 60 degrees Fahrenheit. The cool, almost cellar temperature gives the wine more freshness and lift. Chateau Rocheyron is best served with all types of classic meat dishes, veal, pork, beef, lamb, duck, game, roast chicken, roasted, braised and grilled dishes. Chateau Rocheyron is a perfect match with Asian dishes, hearty fish courses like tuna, mushrooms and pasta as well as cheese. Lilies, dark cocoa, truffle and juicy, black plum notes pop right from the glass. On the palate, the wine is rich, sweet and round. Inky ruby with purple accents in color, the wine offers a tannic backbone, which requires time in the cellar to clarify the freshness in the lush, fruity character. Like many establishments this year, close to 50% of the vineyard was devastated by the frost. Inky ruby and purple in color, the wine offers boysenberry, floral, licorice and black and blue fruit. Sweet, lush, fresh and pure with a concentrated, dark chocolate and plum liqueur finish. Truffle, chocolate, black cherry, smoke, espresso and licorice in abundance are found here. The wine is lush, juicy, fresh, sweet, and full bodied. This will age for at least 2 decades without effort. Luscious, fat, rich and concentrated, this velvety-textured wine has ripe, soft fruits and a smoky, espresso bean, licorice and black cherry-filled, earthy finish. This project, headed by Peter Sisseck and Silvio Denz, is really starting to take off. Medium/full bodied, supple, sensuous, lush fruits with ripe, polished tannins in a forward style allow this wine to be enjoyed in its youth. With the concentration of raw materials, this will also allow for aging for at least 15-20 years. Medium bodied, with a core of fresh, spicy, earthy black raspberries and dark chocolate covered cherries, this plush, polished will drink well young.